St. Lucia Executive Reviews are a great way to see how much our customers love our St. Lucia VIP transportation. We offer luxury St. Lucia transportation to clients from all around the world! Alison and I travelled to St Lucia arriving on the 8th March having previously arranged to be met by St Lucia Executive Transfers. Superb service throughout our visit with excellent vehicles, safe and very attentive driving always with the client in mind. In St Lucia you need to avoid spicy driving. With St Lucia Executive transfers you do! St Lucia Executive transfers are Excellent! From initial contact with frontman Janus Gyan to pick up and drop off by Sam Francis, the experience was one to be remembered. We have used many executive transfer services around the World. The service that St Lucia Executive provided us comes up number one. Our driver Sam Francis greeted us at arrivals and whisked us away in a very nice air conditioned car. Sam provided my wife with mineral water and myself with a cold and delicious local Piton beer. Throughout our way to the Windjammers resort Sam talked to us in a conversational manner, about St Lucia, the economy, oil industry, tourism, military history, food and culture. Sam is a credit to the organisation and provided us with a safe, friendly, comfortable and informative journey to our resort. Janus Gyan and his team leader Elma Philip answer your enquiries and organise your transfer with precision, paying particular interest in making sure 'You' the customer, is given a first class service. I will certainly be recommending St Lucia Executive transfers to my friends, colleagues and associates Worldwide. Thank you for your services, the drivers we had made our stay at Sandals Grande much more comfortable. Sammy was a wonderful driver, he stopped for us to try the local coconut water, which was delicious and now I look everywhere in the states for it! I know it wont be quite the same, but it was the best experience we had! So all in all, it was a great time made even better by Sammy and the driver from the airport upon our arrival. He stopped for us to take some photos and also stopped for my husband at the supermarket.Unfortunately I do not remember his name. I would highly recommend St Lucia Executive private car service for transfers to and from the airport. Thank you again for making our transfers most comfortable. St. Lucia Executive Transfer is the only way to travel in St. Lucia around the island. They allow you to decided when to make stop along the way, determine the temp in the car, and are willing to go above and beyond for their clients. We booked them with only 2 days notice and was accommodated to and was greeted with a warm smile. I had planned a trip to St. Lucia so I could meet up with my husband who is military and has been over seas for 6 month, when I arrived on the island I took the transportation our chosen resort offered, needless to mention this was a huge mistake, I get motion sick very easily and the streets in St. Lucia are not straight with aggressive drivers everywhere, I was sick my entire first day after the 2 hour ride to my resort . My husband was unable to arrive the same day and and due to my motion sickness he arranged for private transportation to be able to greet him when he landed the next day. With other companies this was not going to be possible to be picked up to meet him at the airport. So I was excited to see him, but not excited to get in a car of any sorts. The time came and I was waiting for the car a gentleman got out of the car told me my name and shook my hand and helped calm my nerves and told me it was my car and I make the decisions. I voice my issues with getting car sick and Janus offered the front seat to help, he conversed with me all the way to the airport to help keep me at ease (was a ball of nerves to see my husband) and answered all my questions about his island. He had a sign made with my husbands name for when he arrived. If I had to rate professionalism 10 being the best I would give this company a 12. We were able to arrange our departure without any problems and we were blessed to have Janus again as our driver, now we have a new friend in St. Lucia for sure! Anytime in the future when we return to St. Lucia we will use St. Lucia Executive Transfer for everything. Janus made our transport to and from the airport very simple and first class all the way. I would highly recommend using St Lucia Executive for all transportation needs while on the island, especially if you are looking for a simple process and excellent service. My wife and I were on our honeymoon and Janus and the drivers started and ended our stay on a high note. There is nothing like getting off the plane in a different country and having someone there to welcome you personally and get you to your resort with ease and comfort. Overall excellent service and an excellent company. We were very impressed with your service. It was all made so easy for us by Shaun. As first time visitors to St Lucia he was friendly and informative, letting us know where we were and pointing out interesting places as we passed through. We couldn't be happier. Thank you for the care and friendliness you showed to us both. You are an excellent ambassador for St Lucia and your own company. We will definitely travel with you if we are lucky enough to visit again and would have no heitation on recommendong your service to friends. and gave us a great tour of the island and even taught us some French Creole! Thanks so much for your service. Both rides to and from the airport were fantastic. I will certainly be using your company if I ever make it back to St. Lucia and will be sure to recommend you to anyone else traveling there. I want to sincerely thank you and your other drivers. Our ride from the airport to our resort was great! Having champagne and some local beverages was a great way to begin our honeymoon. The ride from the resort back to the hotel was just as nice. With over an hour drive back and forth having a private air conditioned vehicle was just what my wife and I needed. I have already recommended your company to another friend who is going to St. Lucia in September. My only regret was not being able to stay longer. "I wanted to write a quick note of thanks for the excellent service getting us from UVF to Sandals Grande. The driver was excellent and the ride was as smooth as one could ask for." "We were very satisfied with our transportation from the airport to Cap Maison. Dave was there waiting for us. He was a good driver and pointed out some interesting things along our route. In addition, he answered our numerous questions about things we saw along the way and about life in St. Lucia in general. It was a very enjoyable trip. We will certainly use your transportation service whenever we come to St. Lucia again." Once again I was most pleased with your transfer services to and from the airport and can assure you that any time I return to st Lucia I will be in touch. I will also recommend your service to anyone else I hear of going to St Lucia. Thanks for the prompt attention and the superb service from yourself and both of your drivers during our holiday at The Landings, I was pleased with both of the transfers and would certainly use & recommend your company in future. "Your company's service was exceptional. My wife and I have a great ride from the airport to the resort, which included a couple of photo op stops. We really appreciate your help for our transportation needs. " David showed up as scheduled and we had a terrific trip to the airport. Checking in at the airport in St. Lucia also went well and we had an overall good experience. The flight actually arrived in NYC one-half hour ahead of schedule and we got through US immigration and Customs without difficulty. Thank you very much for your courtesy and service. 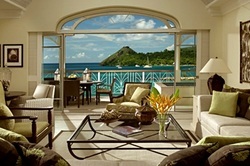 We will recommend that anyone we know that plans to visit Sandals Grande St. Lucia use your service. Thanks so much for your service. It was excellent and both drivers were professional and courteous. If i am in st lucia again I would definitely use your service again. We were very happy with our pick up, transportation and driver. Your driver was very friendly, telling us all about St Lucia (things to do, see etc.) made us feel most welcomed. Would have no hesitation in recommending St Lucia Executive transfers, thank you. No surprises with anything, as all arrangements and the driver were as expected. We are already planning on returning to St. Lucia, and will definitely use your VIP Airport Shuttle service again. Thanks for providing a worry-free service! My wife and I were very pleased with our driver Stanis he was very courteous, informative, and personable. Thank you for helping to make the trip memorable. Our travels were safe and comfortable.Our driver to the airport was really friendly and fun. We talked football and he even did a quick stop to sample some local meats (since it was Saturday). I'll have to say that our trip to St. Lucia was fantastic and I really appreciate your service, professionalism and warmth. I will definitely recommend you to anyone who makes the trip! The trip from the airport to Ladera was great. Kendi was great! Very informative and friendly. We will be recommending you to anyone looking for a car service on the island! Your service was great. The drivers were great. Will always use your service and tell anyone about you guys who are going to St. Lucia. Thanks so much for making it stress free! We were very satisfied with the transportation and kind driver. We are now on a boat in the Grenadines. St Lucia is beautiful and we look forward to your transportation services again in the future. I'm happy to say that we enjoyed the ride from the Airport with your driver very much. I would certainly recommend your service to any visitors to St. Lucia. Service was great. Gregory the driver was knowledgeable, a good driver and a great guide. Would certainly recommend your service to other people. Unfortunately I doubt I will visit your island again soon but it is a magic place. The pick up and transport was very professional. We reached our hotel without incident, and your driver was very informative about the island. We were very happy with our pick-up service with your driver Greg on March 18th from the airport to our Jalousie Plantation in Soufriere. The pick up from Ti Kaye Village and transfer to the airport was very efficient, and a very informative driver. Would certainly use your services again, and recommend to any of my friends visiting St Lucia. The service provided was excellent, Thank you. Our Chauffeur provided us with information on the way and the taxi was comfortable and clean and the driver very well presented. Great service, driver was superb, a very good start to our holiday. I wanted to take a moment to thank you for your transfer service last week on our trip to Sandals La Toc. Webster was our driver and he was really great!! He was willing to stop along the way and introduce us to your local breads which were amazing. He was full of tons of information and his driving was very safe and well within the speed limit. Everything was perfect. Thanks so much. We will highly recommend this company and use it again, if we return to St. Lucia. Again, Thanks! WE found your drivers some of the friendliest on the island, especially, Dan, our driver who brought us back to the Airport.